The Tanganyika Masked Weaver was formally described by Anton Reichenow, a German ornithologist and herpetologist. The Tanganyika Masked Weaver was collected by two German explorers, Richard Bohm, and Paul Reichard. In July 1880 Bohm and Reichard, with topographer Edward Kaiser, marched from the port of Bagamoyo into the interior of what is now Tanzania. In November, they founded the Kakoma station and stayed there for nine months. In 1881 Bohm and Reichard explored the Wala River, to the west of Gondo, as far as its mouth. Bohm and Kaiser made a three-month expedition to Lake Tanganyika, returning to the Gondo station at the end of 1881. Later a station was established at Igonda. In October 1882 Eduard Kaiser died on an expedition to Lake Rukwa. In December 1882, Reichard and Bohm left Igonda and traveled to Lake Tanganyika, exploring Karema in Tanzania and Mpala to the west of the lake in the Congo Free State. In March 1883 they found a colony of the Tanganyika Masked Weaver and took some specimens.The nests were in ambatch in knee-deep water. Many nests had 2 chicks, and some had 2 eggs, while other nests were still being built. Some birds and eggs were taken as specimens. The expedition contiued to the DRC where Bohm died of maleria on 27 March 1884. 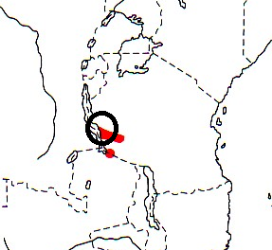 Reichard continued the expedition south to Zambia. He struggled back to the coast, reaching Zanzibar in November 1884. The specimens and notes collected on the 4 year expedition were sent to Berlin, where Reichenow worked through the material and published many new species over the course of a few years. 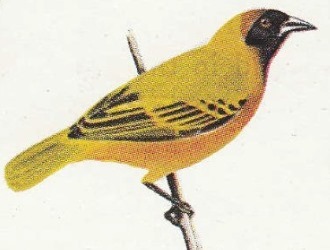 The first illustrations of the Tanganyika Masked Weaver were published by Mackworth (1955), of a male and female on separate plates. Ploceus reichardi	Reichenow 1886,	Zool. Jahrb. pl. 2, p150,	Karema, Lake Tanganyika. reichardi, After Paul Reichard (1845-1938) German engineer, geographer, and collector in East Africa, 1880-1884. 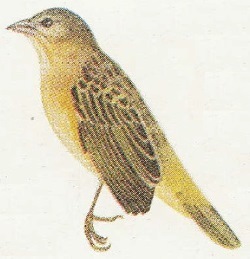 Reichard's Vitelline Weaver (Shelley 1905). Tanganyika Vitelline Masked Weaver, Tanzania Masked Weaver, Tanzanian Masked Weaver. Richard Bohm and Paul Reichard. Karema am Tanganjikasee = Karema, Lake Tanganyika. There are at least 2 types in the Berlin Museum.